Should you really be stretching? – Is it healthful? 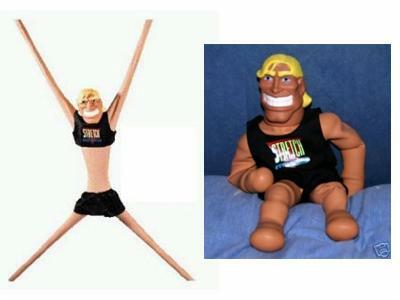 As a child I was huge fan of Gumby and I enjoyed nothing more than giving Stretch Armstrong’s arms a good old, well, stretch. One thing I noticed was that neither Stretch nor Gumby ever sustained a musculoskeletal injury. Nope, not once ever! Was this because they were so stretchy, or do cartoon characters simply not get injured? More importantly, this has prompted me to ask, does stretching before exercise actually do anything? Anything at all? With regard to muscle soreness, it doesn’t matter whether you stretch before or after exercise. In fact, it doesn’t actually matter if you stretch at all! Say what?! Yep, a Cochrane Review – which is basically the Rolls Royce of scientific studies – found stretching to have no substantial effect on muscle soreness in the days after intense exercise (1). 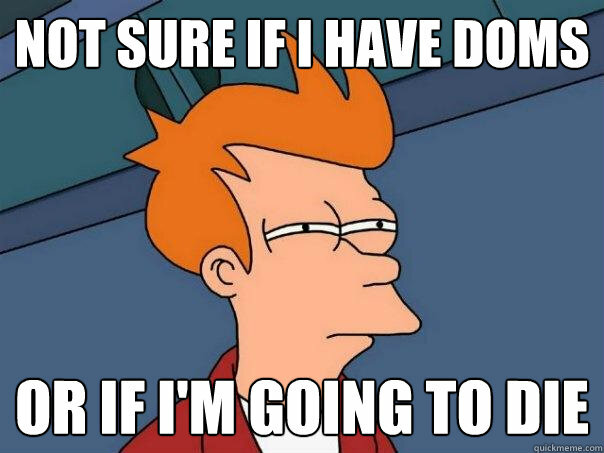 Don’t give in though, we’ll blog on the best ways to conquer DOMS in the coming days/weeks. A Cochrane review (Rolls Royce) also did not find stretching to reduce the incidence of soft tissue running injuries (2). Another, Cochrane review found stretching to have no effect on hamstring injury (3). If you weren’t convinced yet, two other separate systematic reviews (the Porsche of scientific studies) found stretching did not reduce the odds of getting a sports related injury at all (4, 5). Simply put, stretching on its own ain’t going to prevent an injury. Your counter argument, stretch fanatics? Well your counter argument might be here. Yes, before you give up on stretching, there is good quality scientific evidence that long-term regular stretching improves flexibility (6). Yay! If you’re inflexible or your sport requires a lot of flexibility then this could lead to improved performance, although not directly proven (6). However, if you stretch heavily before a sport, it may decrease your explosive power during said sport, as the muscle will be longer and therefore take longer to contract (shorten) (6, 7). DOMS and injury prevention: Nope, consistently proven that it doesn’t work. Flexibility and sports performance: Improves flexibility, which could improve performance. Stretch during the week, but limit stretching before your sport, as this might decrease your explosive power. It may not be an insurance against injury, but if done regularly over a long term, stretching maintains (even improves) flexibility and range of motion. Stretching is beneficial for muscles, bones, tendons, ligaments, or any other tissue involved in motion (even skin and blood capillaries). Anyone who has taken physiotherapy after major leg fractures will understand this. Stretching is a part of warm up and cool down routine. As a general practice first I jog, then I stretch, then I exercise, then I cool down. I was expecting the verdict to be ‘healthful’ or ‘very healthful’. To do real research on benefits of stretching you need to compare groups of atheletes who have never followed stretching routines with those who stretch regularly. I am not sure if it is possible to find atheletes who have never done stretching. Thanks for the comment. I agree with many of your points, but strongly disagree with others. As I mentioned further down in my post, I (and science) believe that stretching modestly improves flexibility when done regularly. This may improve performance but doesn’t correlate with a reduction in injury risk. I believe yes this probably slightly beneficial for muscles, tendons etc. in general. As a physiotherapist and an exercise scientist, I agree that stretching is essential, possibly very healthful, after injuries where there is clinically significant muscle shortening. But that wasn’t really the focus of this blog and doesn’t effect the majority of people. If you look at the latest, most scientific injury prevention programs such as the one designed by FIFA (http://f-marc.com/11plus/exercises/) there is not a single stretching exercise in there. This has been proven to decrease lower limb injury risk on multiple occasions! The effects of stretching are short-lived and in the studies I referenced there was generally a period of not stretching before starting the study, so the athletes would be at baseline flexibility (as if they had never stretched before). This means a study like the one you have mentioned would simply mimic the results of the studies I have referenced. So in summary I would say stretching slightly helps flexibility when done regularly during the week, but offers no real benefit as part of a warm-up or cool-down. It’s easy to think something is right because we’ve done it in the past, but if we still had that attitude we’d be driving our horse and cart to work! Interesting read. I didn’t know this was scientifically proven. Thanks. Thanks Nyina. I know, it’s surprising! Huh, interesting. I have always thought it helped to stretch after exercise, but who am I to argue with the Cochrane Review? I know, it comes as a big surprise. However, if you look at arguably the most popular of all sports injury prevention programs to date, FIFA 11 plus, there isn’t a single stretching exercise. Thanks for another comment! I have not seen FNF7, to be honest. I would certainly agree that very regular stretching enhances flexibility, which may in turn enhance performance in certain sports and activities that require significant flexibility and potentially prevent injury. However, I think every person has a very significant genetic limit that will determine how flexible they will be able to become. In my opinion, end of range eccentric exercise (exercise where the muscle lengthens under the presence of tension) would likely lead to greater enhancements in flexibility, although will still be limited by genetic factors. Simply stretching before exercise (a single bout before each session) , however, will not reduce injury. Based on current data, this appears to have been unequivocally proven. Haha glad to hear it, Doc. ← Should you ice after an injury? Science’s definitive answer.